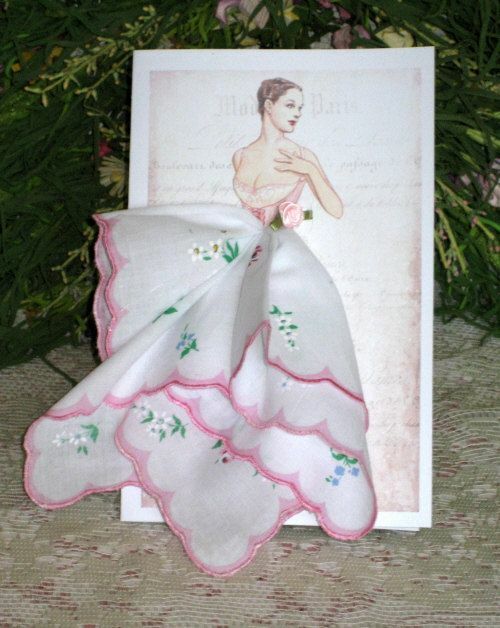 A simple vintage handkerchief has launched a thousand ideas! There is so much to know about life before kleenex (invented in the 1920s). Handkerchiefs made of linen, cotton, and silk- were an essential item. I was surprised to discover the enormous varieties one could choose from. Not only where they utilitarian, they were partly fashion. Often they were given as useful gifts (displayed on a decorative cardstock to enhance their appeal). It would be so much fun to collect these antique cards with their attached hankies (or to try to recreate these cards- I do like to dabble in art!